I'm in the last stages of breaking in my Kimber and have been switching ammo up. I found this pretty reliable. Only had one stovepipe in a box of 50. Recoil was manageable. This stuff is cheap garbage with no power at all. Blazer Brass works well, try it you'll like it! This is the first time I have used this brand of ammo. It is not usually available in my area. My order through Lucky Gunner when smooth and fast, reaching the Pacific Northwest in 4 days. I ran 100 rounds through my P226 without any issue. I thought they ran well, and went straight. Cleanup was also easy. I will use this ammo again. Good price as well. Ordered a case to run through my new Ruger American 9mm compact and it works great. Arrived 2 days early and no issues after 400 rounds. Will buy again. I only buy from Luckygunner. Customer service is great too!! VERY FAST DELIVERLY! WILL ALWAYS BUY HERE! 1500 ROUNDS OF THIS BLAZER BRASS 124 GRAIN AMMO 9MM NOT ONE MALFUNCTION FROM MY SIG P320,GLOCK 19 AND WALTHER PPQ M2. I bought 5 boxes of this ammo. Received the ammo the next day to my surprise. Good job lucky gunner. Fired 250 rounds through my Springfield XD9 Subcompact. Not a single issue of any kind, recoil was very manageable. Lucky Gunner is my #1 destination for all my ammo needs. Great range ammo, fast shipping. Price is right. No issues after over 1,500 rounds. Quality ammo will buy again. Not a single Fail to Fire in 450 rounds through my FNS-9, can't ask for much more from range ammo. Order came super fast which was great, prices a little high but overall good. Customer service is excellent. After about 150 rounds, I have had no problems, what-so-ever. Will buy from again. My order arrived well packaged and in no time, you know you are dealing with the best when customer service's front line like Heidi,Mark and Joe are always ready to help you.Thank you guys and keep up the good work. I have shot around 400 rounds of this ammo through my Ruger SR9c without any issues. Will certainly continue to buy more and will continue to use Lucky Gunner. They have an excellent system and great service. I use it for practice in my GLOCK. I've shot 500 rounds without any misfires or problems. As always, great service from Luckygunner. Always the best for service and quick delivery. I keep liking these folks more and more... this was my second order and it was just as speedy as the first in terms of getting to me. The rounds came well-packaged and secure in their container. The quality and performance are all you can ask for. I'll be coming back again soon to buy more. Very Impressed w/ This Ammo and LuckyGunner! First off, as you probably already know, luckygunner.com is great. 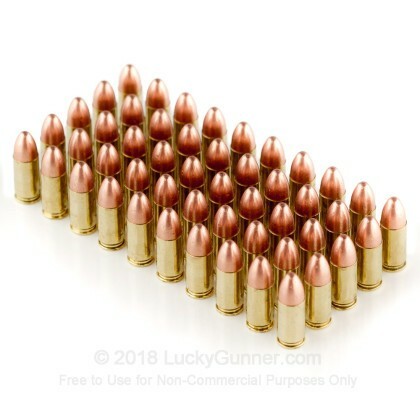 They are the best game in town for ordering bulk ammo online. Our order arrived quickly and they met/exceeded our expectations. With regard to the ammo specifically, we have no complaints. We ran about 500 rounds through a G19 (gen 3), a Sig P226, and two KelTec PF-9s without incident. Accuracy was on par with some leftover American Eagle we had previously purchased from luckygunner. If you're looking for reliable and cheap 9mm, this blazer is a good option. Great ammo! 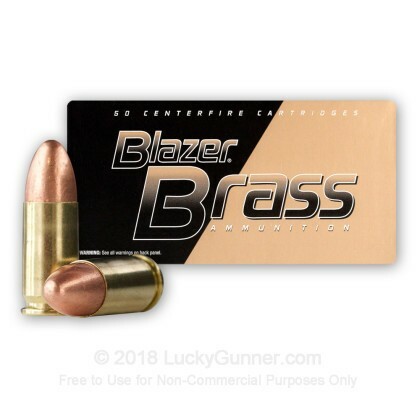 I used Lawman ammo for target practice all the time, but while scanning for ammo I came across Blazer Brass. I checked out the reviews and decided to give it a try. 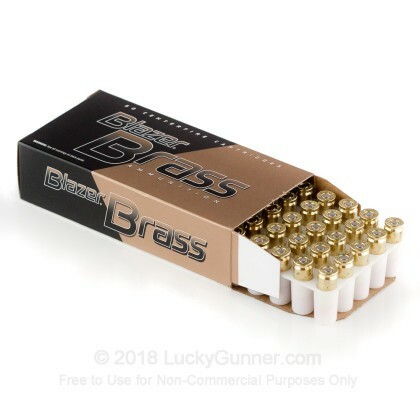 Blazer Brass ammo shoots straight and clean. I shot 200 rounds through my S&W M&P 9C, with no malfunctions. I will buy again. Wanted to run some hotter rounds through my new Glock 19 and the ones from Gunner were half the price of the ones at the local gun shop. Ammo was shipped to me quickly and had no problems with the rounds. Have gone through 3 boxes of them already with no jams. 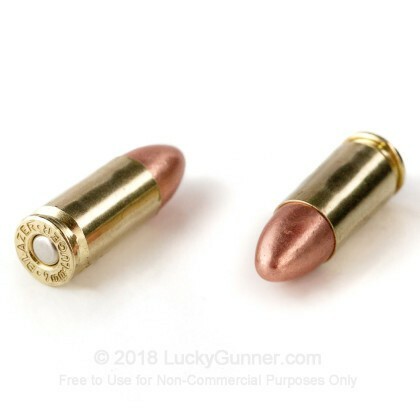 Will certainly try their 115 grain Blazer rounds next. This was my first order from LuckyGunner.com. I was impressed with the price, shipping and quality of service and will be ordering from them again when needed. 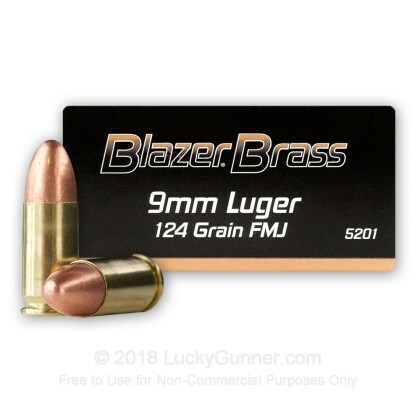 Ordered 1,000 rounds of Blazer Brass 124gr 9mm for a USPSA State Sectional match. Great price, and was delivered within 3 days. Great service! All rounds performed perfectly. This was my first order with LuckyGunner, and I'll definitely be getting all my ammo here from now on. Q: Do you know muzzle velocity for this ammo? A: Hello Rob, Blazer Brass lists this round with a muzzle velocity of 1,090 fps. 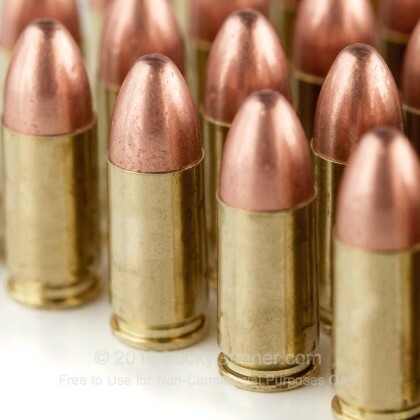 We also have this 9mm - 124 Grain FMJ - Blazer Brass - 1000 Rounds ammo in stock in a bigger quantity.